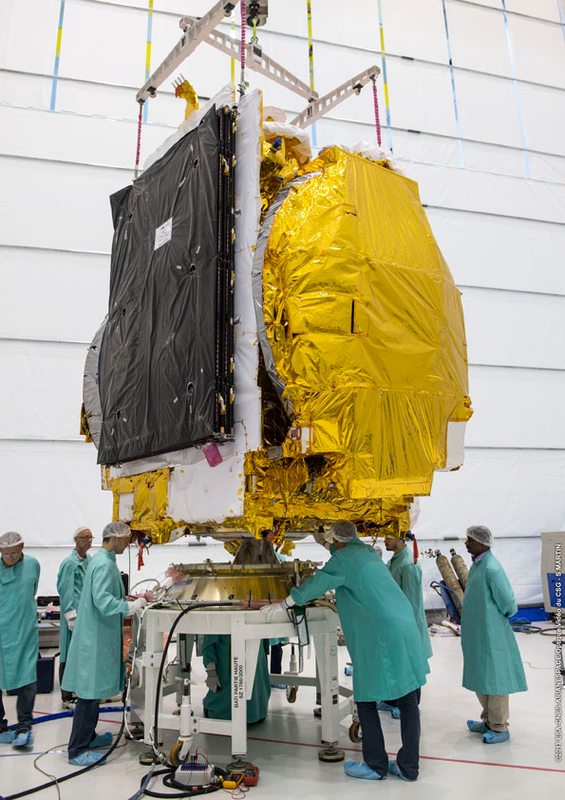 GSAT-17 is a Geostationary Communications Satellite built by the Indian Space Research Organization for operation by Insat, India’s central telecommunications provider in charge of operating GSAT series spacecraft. 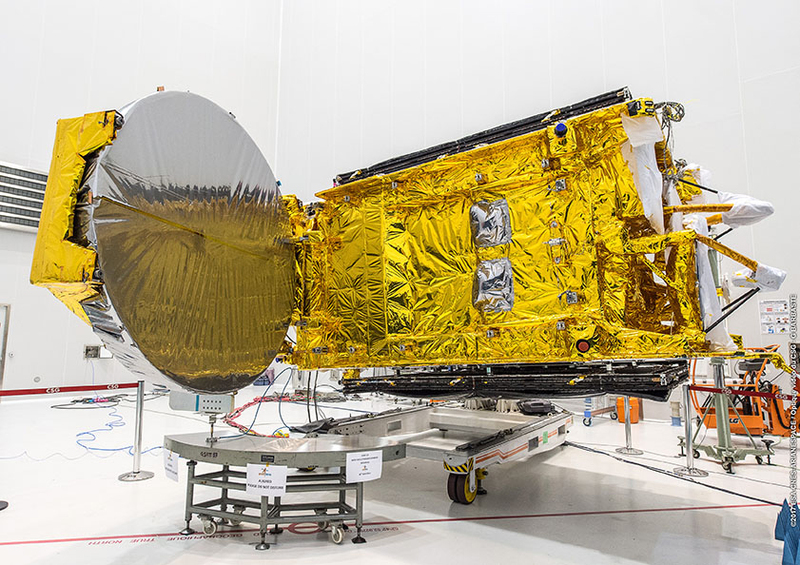 The satellite is outfitted with a payload operating in C- and S-Band to deliver replacement and extension capacity for television, telecommunication, Digital Satellite News Gathering and VSAT services across the Indian Subcontinent. The GSAT-17 satellite was approved in May 2015 with the goal of constructing and testing the satellite over an accelerated period of 30 months for launch in late 2017 and expectations were greatly surpassed with the satellite reaching launch readiness only 25 months after being approved. Weighing in at 3,477-Kilograms, the satellite would have been a candidate for India’s own GSLV Mk.III launch vehicle, however, the Mark III launcher is still in its developmental phase and only flying at a cadence of once per year before it will be able to take over all GEO satellite launches for India. 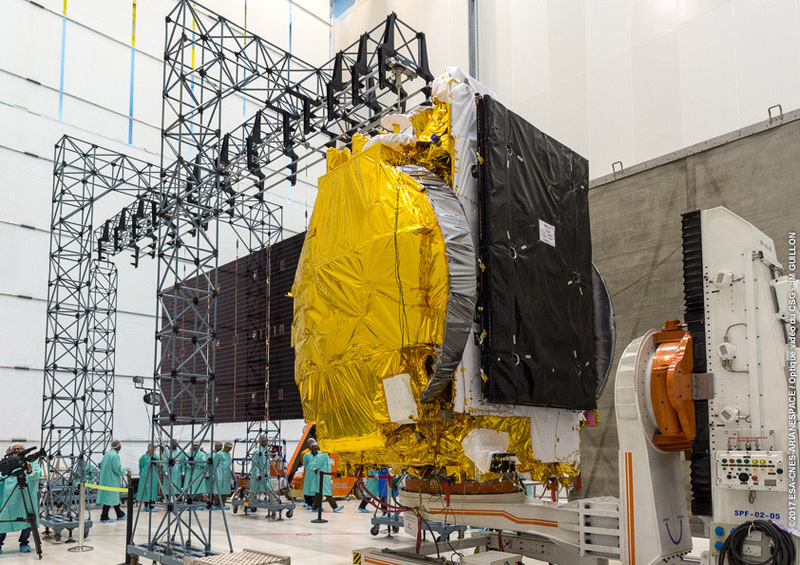 GSAT-17 will provide replacement capacity in different frequency bands to ensure a continuation of operational services while also providing extension coverage to satisfy an ever growing demand for telecommunications services. Augmentation is provided for existing telecommunication, television and VSAT services and the satellite also provides in-orbit redundancy for established societal services. 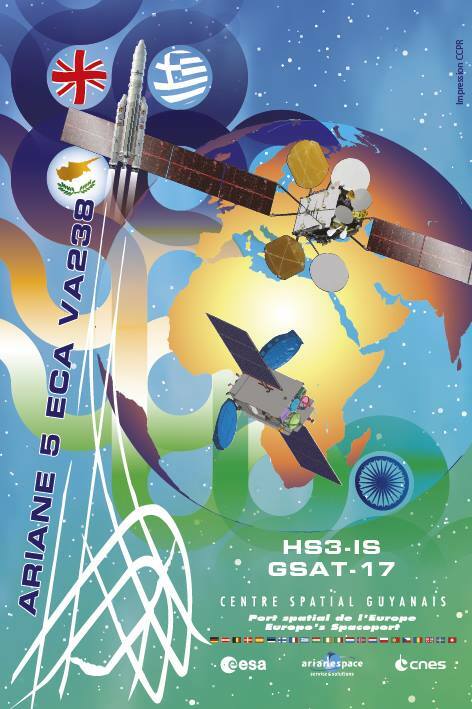 The GSAT-17 communications payload comprises 24 standard C-Band transponders, two lower-extended C-Band transponders, 12 upper extended C-Band transponders, two C-up/S-down + two S-up/C-down Mobile Satellite Services transponders, and one dedicated transponder for Data Relay (DRT) and Search and Rescue (SAR) services. The C-Band transponders deliver replacement capacity while the Mobile Satellite Services payload provides augmentation of existing mobile connectivity across India. GSAT-17 has been built for a 15-year service life and will be operated from an orbital position of 93.5 degrees East, delivering services to the entire Indian territory. 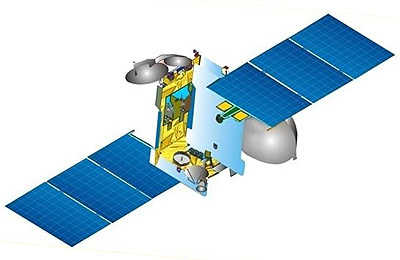 GSAT-17 is based on ISRO’s I-3K satellite platform for spacecraft in the three-metric-ton-class. The satellite’s structure relies on a central cylinder made of Carbon-Fiber Reinforced Polymer which facilitates the craft’s propellant tanks and acts as the structural backbone, carrying launch vehicle and propulsive loads. It also acts as the primary mounting structure for radial aluminum honeycomb panels which hold the various subsystem components and electronics boxes while also providing the structural interface with the outer panels and deployable elements. GSAT-17’s two deployable Solar Arrays generate a total power of 6,000 Watts, fed to Li-Ion batteries. The three-axis stabilization system of the satellite relies on Sun, Earth & Star Sensors and gyros for attitude determination and momentum wheels, magnetic torquers and thrusters for attitude actuation. The propulsion package of GSAT-17 is a standard system used by a number of ISRO satellite projects comprising the trusted Liquid Apogee Motor for apogee-raising maneuvers while eight 22- and eight 10-Newton thrusters are used for attitude maneuvers and stationkeeping in Geostationary Orbit. All three engine types use hypergolic propellants, MON-3 oxidizer (Nitrogen Tetroxide with 3% Nitric Oxide) and Unsymmetrical Dimethylhydrazine as fuel. Tank pressurization is accomplished by using high-pressure Helium. LAM provides 440 Newtons of thrust which equates to 44.87 Kilograms. The engine operates at a mixture ratio (O/F) of 1.65 and has a nozzle ratio of 160 providing a specific impulse of 315 sec. The engine’s injector is a co-axial swirl element made of titanium while the thrust chamber is constructed of Columbium alloy that is radiatively cooled. Electron welding technique is used to mate the injector to the combustion chamber. The 22N thrusters also use co-axial swirl type Titanium alloy injector and a Columbium combustion chamber. The thrusters operate in blowdown mode at a chamber pressure of 0.68 Mpa creating a specific impulse of 285sec. The 22N thrusters have an area ratio of 100. It can be operated in pulse mode with a minimum pulse duration of 8 milliseconds that supplies a minimum impulse of 65mN*sec. Each 22N thruster assembly weighs 0.8 Kilograms. ISRO’s 10N bi-propellant thrusters are similar to the 22N units and leverage a number of lessons learned from their development. They use similar swirl type injectors which create an unintentional but welcome film cooling in an otherwise radiatively cooled engine design. The combustion chamber and nozzle are manufactured from Columbium alloy and the thrusters have an area ratio of 200. The 10N thrusters deliver a 285sec and achieve a minimum impulse bit of 30mNs. Copyright © 2019 Ariane 5 VA238 | Spaceflight101. All rights reserved.